Muscanell Stair Parts to Match Your Muscanell Flooring…. We take great care in crafting treads, risers, and nosing to match our unfinished flooring. Each order is made on a custom basis. On all stair parts, we start with lumber that is dried to 5-7% moisture content. Compared to most production mills, we typically use wider pieces to make up our treads. All pieces are straightened just prior to gluing. We dry fit pieces to create stress-free glue joints. 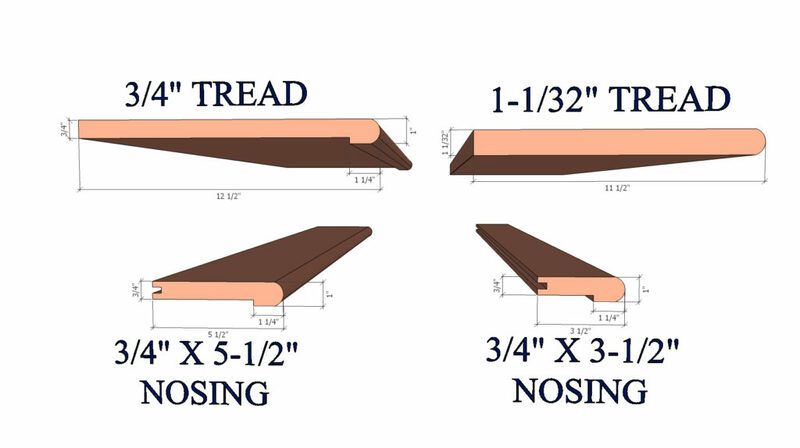 Treads are sanded to 120 grit on either 1 or 2 sides, depending on the type of tread. Double returns are attached on one end, and provided unattached for the other end. 3-1/2” and 5-1/2” widths available in most species and grades. Please contact us or call your sales rep for availability and pricing.